Decades before exotic pets became popular, the United States had some very odd animal laws, which today raise several questions about our ancestors' interactions with wildlife. For example, it was once illegal for a gorilla to ride in the back of a car in Massachusetts -- but what about the front seat? 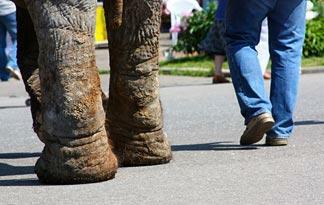 And in Florida, a law stated that parking fees must be paid for an elephant tied to a meter, just as if it were a car. But when were elephants a popular mode of transportation in the Sunshine State, and how exactly do you tie an elephant to a parking meter anyway? These days, most states have pretty standard exotic animal laws in place that either ban wild animals as pets or require certain permits. Although most weird pet laws from years past have long been repealed, we found five states where the exotic animal laws still border on bizarre.